Chinese food has come to mean a lot of different things to a lot of different people. The mere use of the label is almost always hopelessly vague in practice. Within China itself every region possesses distinct culinary traditions, ranging from Cantonese in the south to Szechuan in the west to Shandong in the east. Outside the country each immigrant population incorporates varying levels of authenticity in its cooking combined with an equally variable amount of adaptation to local taste. Thus depending on where you live and travel, you’ll develop a personal understanding for what you call “Chinese food”. 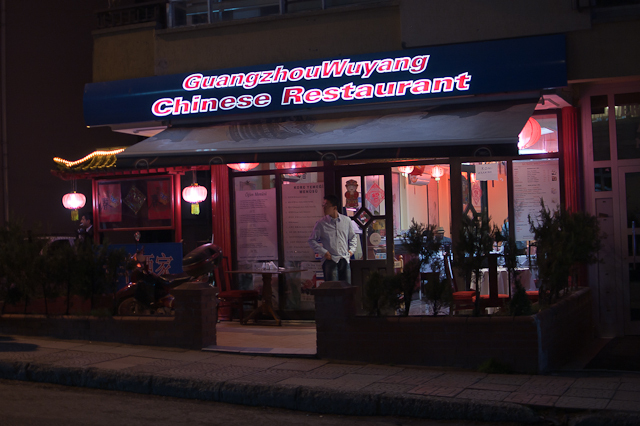 In Ankara the options for Chinese, like most foreign cuisine, are quite limited. One such option is Guangzhou Wuyang in Kavaklıdere (Google Maps). Two weeks ago I sampled its cooking and found the experience to be very satisfying. Was it the best Chinese food I’ve ever had? No. But did I leave feeling happy? You bet. Guangzhou Wuyang takes some liberties with its menu, going beyond typical Chinese food to offer both Japanese and Korean as well. 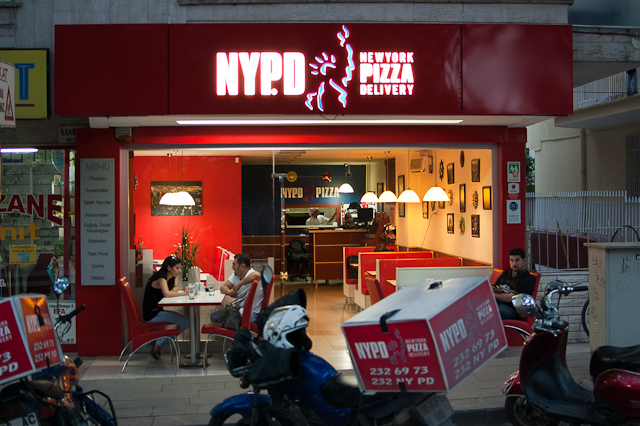 This multiethnic approach is similar to Sushi Co. and Quick China, the other popular Asian restaurants in Ankara. But on the whole Guangzhou Wuyang still strikes me as being far more authentic; its competitors feel more at home in a shopping mall than anywhere in China. Further adding to its authenticity, Guangzhou Wuyang was full of Asians during my dinner. This is always a positive sign when rating Chinese food in a foreign city. If you dine with a friend, I’d recommend the “Menu for Two”. You’ll be able to taste the full range of the menu in a cost-effective manner. It includes soup, kim chi, egg rolls, sweet-and-sour chicken, beef and broccoli, fried rice and dessert. At 35TL ($23 at 1.49TL/$) per person, it’s pricey by Ankara standards, but a good value for the amount of food you get. And for those desiring a beer with their dinner, alcohol is served. Çiğ köfte, like iskender, is another staple of Turkish cuisine that can be rather underwhelming when poorly prepared. Shortly after arriving in this country, I had several mediocre experiences that left me wondering why çiğ köfte was so popular. It wasn’t until I found Meşhur Adıyaman Çiğ Köftecisi that I grew to appreciate the flavors of this tasty dish. 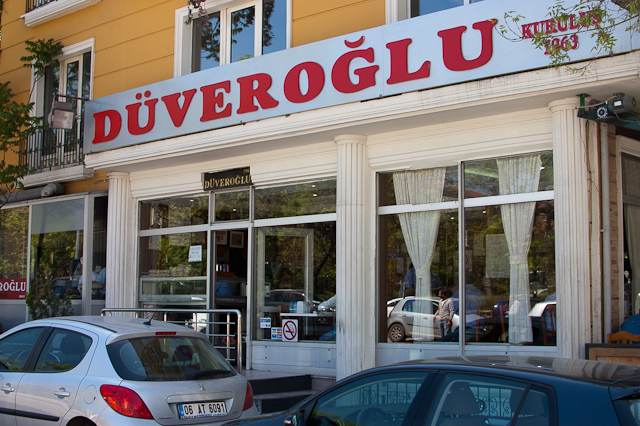 Meşhur Adıyaman is a chain restaurant with branches all over Turkey and a few abroad. 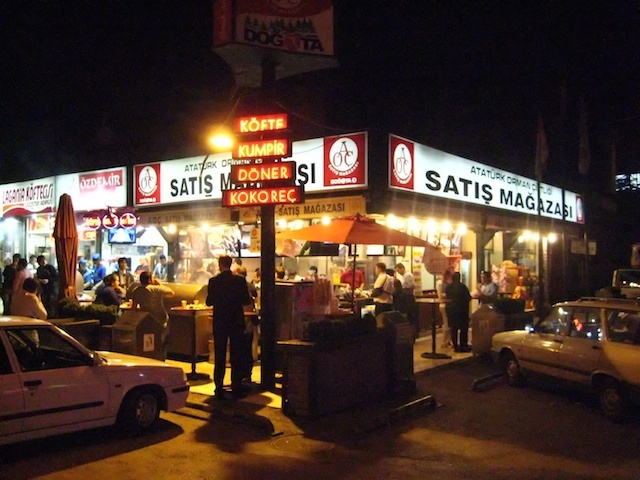 In Ankara alone, there are twenty-five shops. I first discovered Meşhur Adıyaman in Kavaklıdere, the more posh section of the city that suffers from a serious dearth of good, cheap food. When I’m forced to spend an evening in the overpriced bars around Tunalı Hilmi, I get some solace from knowing that delicious and inexpensive çiğ köfte is waiting before I go home. Meşhur Adıyaman sets itself apart by preparing its dürüm with a combination of pomegranate and spicy sauces, nicely complementing the strong flavors of the çiğ köfte. The man at this location also spreads the “meat” in such way that it is thin enough to avoid overpowering the other ingredients while still giving a distinct taste to each bite. Finally, the lavaş at Meşhur Adıyaman is also thinner than most other places, allowing the çiğ köfte to be the focus of the dürüm, not the bread. The Kavaklıdere branch of Meşhur Adıyaman is located on Bestekar Sk. under the Corvus Bar (Google Maps). 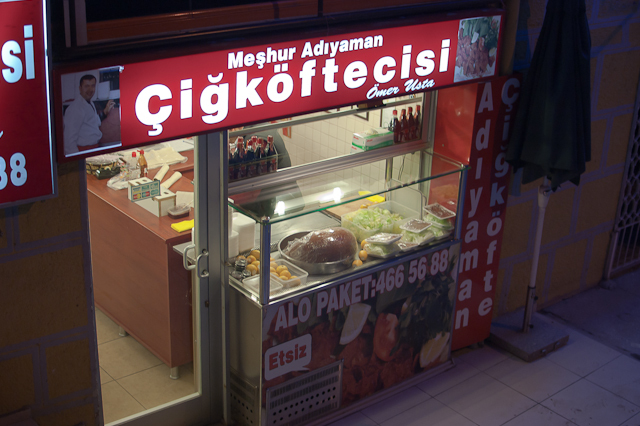 A dürüm costs 3TL ($2 at 1.52TL/$), while half and full portions are priced at 5TL ($3.30) and 10TL ($6.60), respectively. P.S. 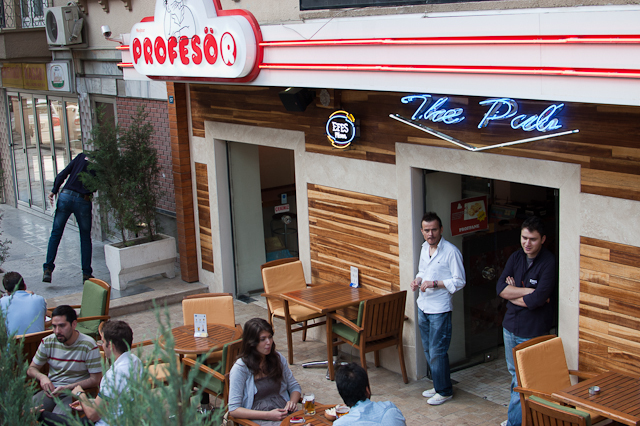 If you look at the exterior picture of this Meşhur Adıyaman branch, “etsiz” is visible at the bottom. This seems to suggest that this particular çiğ köfte is made without meat, which strikes me as odd given the name of the dish. I’d appreciate it if someone with greater expertise could fill me in with the truth of the matter. UPDATE: See the comment section for the answer. UPDATE: I’ve found out that this particular branch is now closed, which is tragic because İbrahim, the man who ran it, truly was an usta. The other Meşhur Adıyaman’s around the city are good, but not as good as this one. Turks often ask me for examples of traditional American cooking. Such examples are difficult to ascertain since our cuisine is in many ways an amalgamation of the different culinary styles brought to our great country by numerous waves of immigration. One distinctly American food, though, is the hamburger. Originating in the late 1800s, the exact birthplace and inventor of this sandwich remain subjects of dispute. But through the popularity of American chain restaurants, it’s impact on dining both in the U.S. and around the world is uncontested. There is more to a burger than the Big Mac or Whopper. Many who are used to these fast-food staples often forget that all burgers are not created equal. Restaurants across America create far more intricate, gourmet versions that incorporate top-quality meats and special ingredients, such as blue cheese, jalapeños or even lobster. In Ankara, the options for high-end burgers like this are quite limited. The recent opening of the Kentpark A.V.M bought a new place for those craving beef-laden deliciousness. 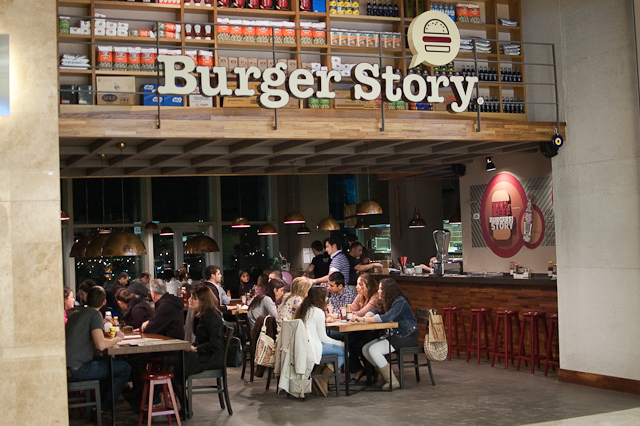 Appropriately named Burger Story, this establishment delivers the goods for those seeking American-style tastes here in Turkey. Burger Story’s menu offers about a dozen options ranging from the classic to the more complex. The cornerstone of these burgers is the excellent meat. You’ll immediately notice the fresh-ground difference. Several burgers are also topped with some nice sauces, a welcome addition in a country where the food is too often sauce-less. I’ve visited Burger Story twice in the past few weeks and was really impressed with the more traditional offerings. I’d highly recommend the caramelized onion and mushroom burgers. The cheese streak, rokfor soslu and “White Castle” are also quite good. However, avoid the falafel “veggie” burger; the flavor is dry and overpowering from the excessive starch. You might be enticed by Burger Story’s milkshake selection. While better than most in Turkey, they’re sadly underwhelming if you’ve ever had a proper milkshake in America. They lack the thickness that, for example, separates a chocolate milkshake from chocolate milk. My friends reported otherwise after a different visit, but I still expect more consistency for the premium price. Burger Story is on the ground floor of Kentpark (Google Maps). To the chagrin of my bank account, it’s on the pricey side. Burgers average between 15TL and 20TL ($10 and $13 at 1.53TL/$). Although last week’s attempt to find superlative dining in Ankara came up short, I continued the search this weekend with a visit to Kalbur Fish Restaurant. You might be somewhat skeptical of the potential for good seafood in a city located about as far as one can get from a body of water in Turkey. In most cases, you’d be correct. But Kalbur is something very special. By combining traditional cooking techniques with an innovatory approach to seafood, it delivers a meal like no other in Ankara or even, dare I say, Turkey. Without question, Kalbur will change the way you look at Turkish cuisine. It is deserving of the laudatory enthusiasm often heaped upon it by journalists and food aficionados alike. Situated deep in a quiet residential area of Oran, Kalbur is unassuming from the outside. Simple place settings and unadorned decor give a decidedly understated feel to the ten-table restaurant. The owner, Mehmet, and his wife, Bilen, have been cooking magic in this humble spot since 1990. They have developed a reputation for being a bit cold to their customers, something one might expect from artists overseeing their craft, but all is forgiven once you taste the food. Kalbur specializes in taking Turkish classics, such as börek, köfte, kokoreç and mantı, and reinventing them with the wonders of the sea. 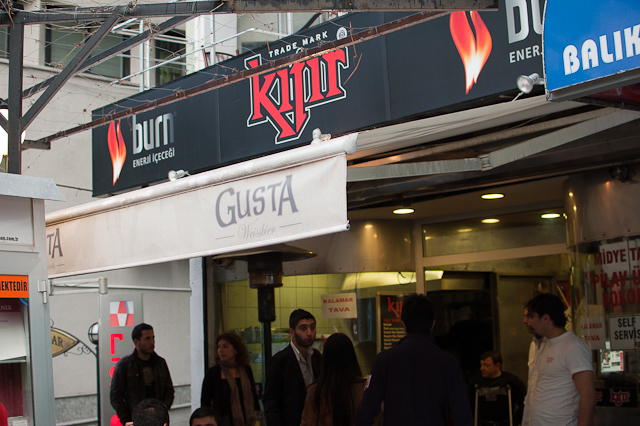 You’re not going to find the typical whole-grilled-fish-on-a-plate offering that one would get on the Kordon in İzmir. 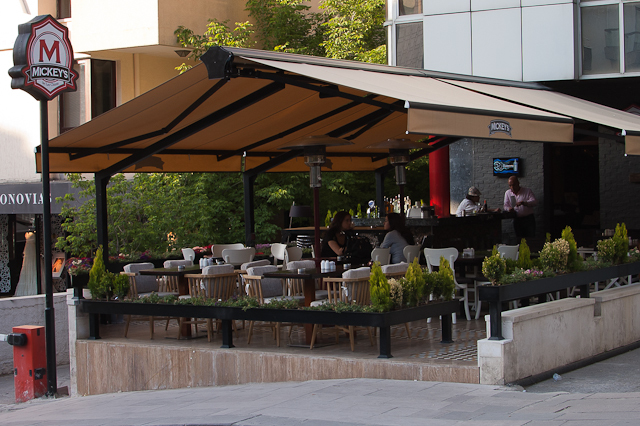 Kalbur’s approach represents the type of creative license I so often yearn to see in other Ankara restaurants. More Turkish chefs need to test the balance between respecting culinary tradition and pursuing innovation in their work. The portions at Kalbur are small and best enjoyed mezze-style with friends. It’s impossible to choose poorly, but some dishes are better than others. It’s also worth noting that the menu changes frequently with ebb and flow of Mehmet and Bilen’s inspiration, so expect some variation on what I describe here. On Saturday, my friends and I ordered twelve courses covering the whole range of the night’s menu. The salmon dolma, seafood köfte, shrimp börek and grilled octopus were our favorites. Two days later I still find myself imagining their taste in my mouth. We would also recommend trying the artichoke hearts stuffed with a cheese-fish paste and the mixed-seafood calamari dolma. The stuffed mussels, octopus salad and seafood kokoreç were all quite tasty as well, but less remarkable than the others and could be excluded to save on cost. The seafood mantı might have been the only bust of the night, although you should try it for yourself if you generally enjoy traditional equivalent. Kalbur is located in Oran Şehri Çarşı Merkezi C-3 Blok (Google Maps). It’s not the easiest place to find, but most cab drivers in the area should know the address. Additionally, Kalbur is closed on Mondays and reservations are required at least a week in advance (Telephone #: 312 490 50 01). 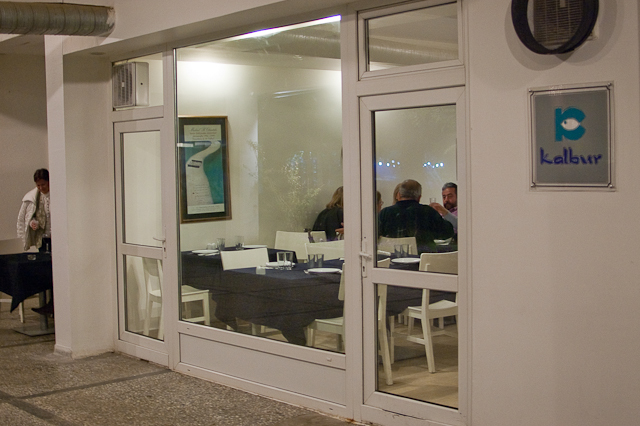 As one might expect for a restaurant of its caliber, Kalbur is not cheap. Our bill came to 275TL ($180 at 1.53TL/$), so about 75TL ($49) each for our four-person party after tip. Alcohol is served and rakı is certainly recommend to complement your fish. Do note that credit cards are not accepted.